The paper reports on an empirical study adopting a mixed research method, aiming at improving primary students’ collaborative problem solving competency in project-based learning with productive failure (PF) instructional design in a seamless learning environment. Two Grade Six classes participated in a project-based learning of “Plant Adaptations”. In Class 1 with 27 students, the project-based learning was conducted with PF instructional design; in Class 2 with 26 students, the project-based learning was conducted without PF instructional design. The learning activities spanned across farm, class, home and online spaces supported by mobile devices. Data collection includes various students’ created artifacts in groups in the inquiry process, student reflections, student focus group interviews and pre- and post-domain tests. Both qualitative and quantitative data analysis methods were employed. The research findings show that compared to Class 2, the students in Class 1 gained deeper understanding of conceptual knowledge and produced better group artifacts in collaborative problem-solving quality than those in Class 2; and the students in Class 1 were more positive in facing the challenges in their project-based learning process, and developed a sense of ownership of their learning. The findings imply that PF instructional design is conducive to developing primary students’ collaborative solving competency in science learning in a seamless learning environment. In the digital age, problem solving and collaboration are twenty-first century skills critical for preparing learners to live in a global economy and a society with increasing diversity, rapid change and efficient communication (Voogt and Roblin 2012). This is in line with what is advocated in science education in Hong Kong which comprises a core component of the primary school General Studies’ curriculum. Doing science involves using the methods and procedures of science to investigate a phenomenon, test and develop understanding, solve problems and follow interests (Hodson 2014). It promotes creativity through the problem-solving process in authentic learning environments supported by digital technologies (The Fourth Strategy on IT in Education 2014). Scaffolding before and during learners’ inquiry is advocated in project-based learning, especially for younger learners (Häkkinen 2003). However, studies in recent years have demonstrated potential benefits of collaborative problem-solving prior to instruction in learners’ inquiry to enhance their conceptual understanding in mathematics and problem solving competency (Kapur and Bielaczyc 2012; Loibl and Rummel 2014; Song and Kapur 2017), but rarely are studies found adopting this approach in science learning in primary education. Mobile and networked technology provides new opportunities for supporting learners’ collaborative inquiry across authentic, multiple settings (e.g. Anastopoulou et al. 2012), and capturing and creating artifacts to visualize their thinking (Blumenfeld et al. 1991). 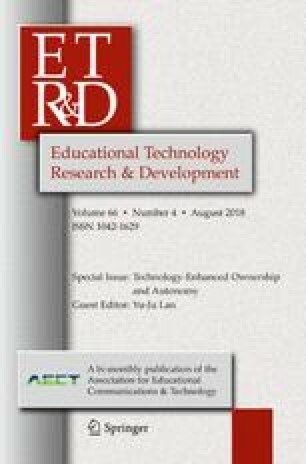 This empirical study attempts to explore an innovative pedagogical design to improve upper primary students’ collaborative problem solving competency supported by mobile technologies across farm, class, home and online. Project-based learning can adopt structured, guided or open inquiry approaches. In structured inquiry, the project questions and procedures are provided by the teacher as scaffolds, while students generate an explanation supported by the evidence they have collected; in guided inquiry, the teacher provides students with the research question, and students plan their methods to address their questions and work out the explanations; and in open inquiry, students have opportunities to act like scientists to raise their own questions, design and carry out their plans and share their results (Banchi and Bell 2008). Structured and guided inquiry approaches are advocated in existing collaborative problem solving for young learners, where scaffolding is provided when students encounter learning difficulties to avoid failure in making the inquiries (e.g., Häkkinen 2003). Studies adopting a guided inquiry approach to science learning show that it can help young learners develop inquiry learning competency scaffolded by the inquiry-based learning model for learners’ inquiry process (Song 2016); enhance learners’ chemistry conceptual understanding using simulation as implicit scaffolding so that they do not undergo frustrations in their exploration of science problems (e.g., Moore et al. 2013). However, Banchi and Bell (2008) posit that guided, and procedural based hands-on activities are not the same as real science inquiry (i.e., open inquiry), which gives students the opportunity to construct their own questions related to the science content they are investigating and become drivers of their own learning. However, open inquiry is challenging for both teachers and students, and has rarely been practiced in science inquiry (e.g., Häkkinen et al. 2017; Lakkala et al. 2005). Project-based learning is premised on constructivism, experiential learning and situated learning theories (Hmelo-Silver et al. 2007; Kolb et al. 2014). In science learning, this approach aims to involve students in working at real-world problems in small groups and striving for solution options where the teacher acts as a facilitator (Brundiers and Wiek 2013). Thus, problem solving competency is critical in carrying out the project. Problem solving competency means engaging students in solving a problem using different strategies, from multiple perspectives and with diverse modalities. Its processes include: exploring and understanding; representing and formulating; planning and executing; and monitoring and reflecting (PISA 2017, p. 9). In many cases, problem solving involves collaboration, especially in dealing with complex tasks. Collaboration is defined as “the activity of working together towards a common goal” (Hesse et al. 2015, p. 38). Collaborative problem solving requires social and cognitive skills to develop shared understanding, take appropriate action, and establish and maintain team organization to solve the problem (Dillenbourg 1999; Fiore et al. 2010). The theoretical underpinning is premised on social constructivist learning theories that emphasize learning through social interactions (Vygotsky 1978). The research literature shows that project-based learning can help students enhance learning performance in knowledge advancement and skill development, and motivate them to learn (Mioduser and Betzer 2007). To cope with the increasing complex problems in a fast changing society, it is crucial for educators to nurture learners with twenty-first century skills to think and act like real scientists, asking questions, making hypotheses, and carrying out investigations (Kelley and Knowles 2016). Such studies have rarely been reported due to the unpreparedness of teachers and lack of meta-cognitive skills of learners in learner-driven scientific inquiry (Häkkinen et al. 2017; Lakkala et al. 2005). Häkkinen et al. (2017) point out that current education does not provide suitable twenty-first century learning environments that focus on collaboration and social learning, and that require students to take advantage of digital technologies for collaborative problem solving. In the digital age, learning becomes ubiquitous and seamless. Seamless learning refers to “the seamless integration of the learning experiences across various dimensions including formal and informal learning contexts, individual and social learning, and physical world and cyberspace” (Wong and Looi 2011, p. 2364). Parallel to it are the challenges confronting educators to reconsider pedagogies to meet the demands of the rapid changing era where learning is reshaped by the use of mobile technologies. In such a learning environment, the learner can decide where, when, and how she or he will meet their own learning needs (Khaddage et al. 2016), thus it can help increase their sense of ownership and learning autonomy by setting their learning goals and taking charge of their own learning. In the meantime, in a seamless learning environment, students are able to make use of the affordances of mobile technologies to explore science problems in a real learning context by collecting video, audio, picture and text data using embedded apps, search information online and uploading files without time and place constraints (e.g., Lai and Hwang 2015; Song 2016; Wong et al. 2015). 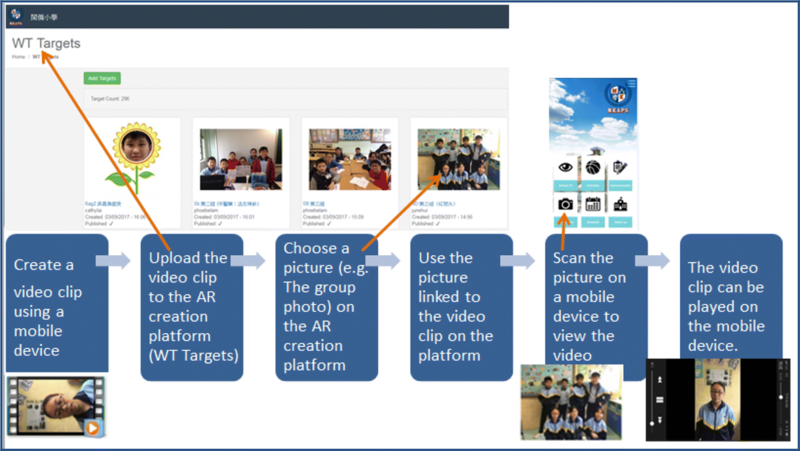 For example, Song (2016) reported a study, aiming at investigating how primary school students developed their science inquiry skills supported by mobile devices, taking the science learning topic of “Black Spots” as an example. The research findings show that the students advanced their collaborative inquiry skills in a guided inquiry-based learning leveraged by mobile technologies in primary school education. Because project-based learning centers around finding a solution to a driving question that organizes and defines learning needs, and the creation of a series of artifacts that represent understanding of the driving question (Blumenfeld et al. 1991), mobile technologies can help learners document their collaborative inquiry process in different settings and make their thinking visible by providing evidence (e.g., Song 2014, 2016). Productive-failure (PF) is defined as “a learning design that affords students opportunities to generate solutions to a novel problem that targets a concept they have not learned yet, followed by consolidation and knowledge assembly where they learn the targeted concept” (Kapur 2015, p. 52). PF instructional design involves two phases: (1) students first engage in unguided problem solving activities to elicit their prior knowledge, particularly the failure to solve the problem; and (2) students then use this information to consolidate and aggregate new knowledge after the teacher helps solve misconceptions (Kapur 2016; Kapur and Bielaczyc 2012). In the initial problem solving activities without scaffolding, the learners’ solutions may result in failure due to the fact that learners are commonly unable to discover or generate correct solutions to a novel problem by themselves; instead, they may be able to generate sub-optimal or even incorrect solutions to the problem, so the process can be productive in preparing them to learn better from the subsequent instruction that follows (Kapur 2014). Indeed, in science learning, generating “wrong answers” may help students focus their attention on the complexities and frustrations of a good investigation plan or design (Hodson 2014), and knowing what learners do not know makes failure productive (Granberg 2016; Loibl and Rummel 2014). Kapur (2010) compared a PF instructional design with a traditional instructional design on the topic of “rate and speed” in a secondary school in Singapore. The research findings show that students from the PF instructional design condition significantly outperformed their counterparts from the traditional instructional design condition in the post-test on procedural knowledge, conceptual understanding and problem solving competency. This is in line with the research findings in Granberg’s study (2016), which examined secondary students’ problem solving process in pairs to solve a linear function problem using GeoGebra under the framework of productive struggles for problem-solving. The findings show that although students made errors and erroneously constructed new knowledge, a majority of the students succeeded in reconstructing useful prior knowledge and constructing correct new knowledge to solve the problem. In the literature review on “how problem solving followed by instruction supports learning”, Loibl et al. (2017) posit that problem solving instructional design is beneficial to students’ conceptual knowledge and the abilities to transfer if the problem is presented in the form of contrasting cases or if students’ problem solutions are discussed in subsequent instruction. Nevertheless, the majority of studies adopting PF instructional design have been conducted in mathematics learning (Kapur 2010, 2014, 2015; Loibl and Rummel 2014; Loibl et al. 2017), whereas studies in science learning, especially in primary school education are rarely found. Even rarer are studies that have been designed by adopting PF instructional design to examine students’ collaborative problem solving competency in a seamless project based learning environment across different settings. The literature shows that (1) the majority of studies have adopted structured or guided inquiry approaches in project-based learning to provide scaffolding during the process of learners’ science inquiries; rarely found are studies involving open inquiry where students can think and act like real scientists to drive their own investigation because teachers and students lack the skills for dealing with complex inquiry learning; (2) in the twenty-first century, technology-rich learning environments conducive to collaborative problem solving are critical for learners to cope with the increasingly complex and authentic problems in both formal and informal settings, and to become problem solvers and communicators, but neither teachers nor students are well prepared for such practices; (3) to explore science problems in a real learning context in project-based learning, mobile technology could be used to create a chain of artifacts that are organized to represent understanding of the problem to be investigated anytime, anywhere; and (4) PF instructional design has been adopted to improve learners’ collaborative problem solving competency in mathematics learning in a host of studies and positive results have been reported, but rarely found are studies that have adopted this design for improving learners’ collaborative problem solving competency in science at primary level. The above issues motivate the researchers to investigate the effectiveness of PF instructional design in learners’ project-based learning in a seamless learning environment to improve their collaborative problem solving competency a skill critical for the twenty-first century in primary education. On the one hand, the learners are provided with opportunities to investigate the problems collaboratively like scientists (Banchi and Bell 2008) in authentic learning environments supported by mobile technologies across different settings; on the other hand, learners are scaffolded for their misconceptions and “failures” after the collaborative problem solving process, hence they can identify and solve their misconceptions, assemble and consolidate their conceptual knowledge, and be encouraged to explore extended science problems in a seamless learning environment. Thus, the research question is: What is the effect of project-based learning with PF instructional design in a seamless learning environment on students’ collaborative problem solving competency? This study was conducted in two Grade 6 classes (Class 1 and Class 2) with 27 (14 females and 13 males) and 26 (14 females and 12 males) students aged between 12 and 13 years’ old respectively working on the project of examining “Plant Adaptations” in a seamless learning environment in a primary school. The age mean in Class 1 was 12.46 (SD = .508); and in Class 2 was 12.48 (SD = .509). This indicates that the gender was balanced and the age was similar in the two classes. There were four groups of students in each class. Each group had 6 or 7 members with mixed abilities. The school provided an iPad and a laptop to each group. Students could use their own mobile devices as well in their inquiry. 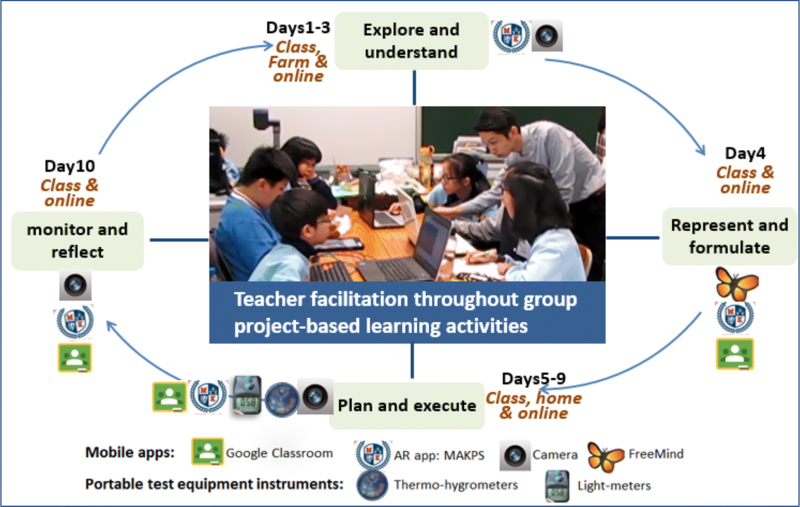 Before this study, the students had conducted project-based learning supported by mobile devices for 2 years, and were familiar with the apps of (1) a social network platform—Google Classroom for groups to document their project-based learning process; (2) a built-in camera on mobile devices (iPad, laptop and Smartphones) for picture and video clip taking to collect data; (3) a graphic organizer—FreeMind app to draw concept maps or mind maps on mobile devices (iPad and laptop); and (4) an augmented reality (AR) App: MKAPS on mobile devices (iPad). The AR artifacts were created using the school’s AR creation platform (http://mkaps.ar.myprint.asia). Students created a video clip first, then uploaded it to the AR creation platform to generate a picture. As long as students downloaded the app—MKAPS from Apple Store, they could scan the pictures embedded in the booklet to view the videos. The students could make short video clips throughout their project-based learning process. The process of making the AR artifacts is shown in Fig. 1. In addition, researchers also provided thermo-hygrometers and light-meters for each group and showed the students how to use these meter devices before the study. The project lasted for 2 weeks. Two teachers (one male and one female) joined the project. Both of the teachers had over 6 years’ teaching experience in General Studies in the primary school. They had been involved in the project-based learning programme initiated by the school in the past 2 years. Before conducting this study, two 2-h teacher professional development workshops were organized on social constructivist principles and pedagogical models, especially on inquiry/project-based learning, and PF instructional designs in the school by an experienced researcher, who has been involved in mobile technology supported science inquiry studies at the primary level for about 8 years, and who started adopting the PF instructional design in science and mathematics learning 2 years ago. The researcher also co-designed the project of “Plant Adaptations” with the teachers after the two professional development workshops. The female teacher used project-based learning with PF instructional design; and the male teacher used project-based learning without PF instructional design. The two classes started and completed the project-based learning at the same time. The topic of the project was “Plant Adaptations”. The objectives of the project “Plant Adaptations” for both Class 1 and Class 2 were to choose different kinds of Rhizome plants to grow, and find out factors that influenced the growth of the plants they chose. In doing so, students needed to work in groups to make their own plans to raise the plants. Groups in Class 1 chose the plants themselves: carrots for Group 1, mung beans for Group 2, shallots for Group 3, and lettuce Group 4; groups in Class 2 chose either mung beans or garlic plants recommended by the teacher. In order to understand better the factors that contributed to the growth of the plants, the students usually prepared two or three plants of the same kind to grow in different conditions (e.g., different intensity of light, and amounts of water).Then they observed, documented and explained their process of growth. Both Class 1 and Class 2′s project-based learning instructional designs in a seamless learning environment consisted of four task components: (1) explore and understand, (2) represent and formulate, (3) plan and execute, and (4) monitor and reflect. The project-based learning lasted for 2 weeks (10 week days). Class 1 received project-based learning with PF instructional design in a seamless learning environment (see Fig. 2.). 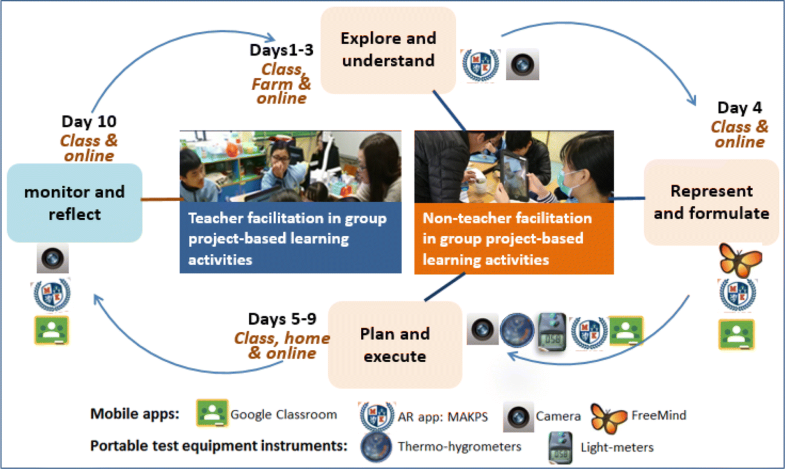 Figure 2 shows that in the three project-based learning task components “explore and understand, represent and formulate, and plan and execute”, the groups performed the project-based learning in a seamless learning environment without teacher facilitation. In the last project-based learning task component “monitor and reflect”, the teacher provided facilitation. The teacher’s role was to identify and note down groups’ misconceptions and learning difficulties in order to facilitate them after groups reflected and shared their project work in class. Class 2 adopted project-based learning without PF instructional design (see Fig. 3). Figure 3 shows that throughout the project-based learning activities, the teacher provided facilitation when groups encountered problems or had misconceptions. The learning activities were not linear but iterative and interactive among the task components in the project-based learning instructional designs. Figures 2 and 3 are presented below. Days 1–3 “explore and understand” task: Students did the pre-domain knowledge test and were divided into different groups in class on the first day; then they were oriented in project-based learning in class. After that, they worked in groups to search resources online and might choose related Youtube video clips related to plants to make AR artifacts on the second day for project booklet making preparation. Finally, on the third day, they joined a field trip to a school farm to gain some understanding of plants and their living environments. In the field trip, they used iPads provided by the school for each group as well as their own smartphones to take pictures of the plants that they were interested in. Day 4 “represent and formulate” task: Groups worked together to upload the photos they took during the field trip the day before to Google Classroom. They also reflected on what they learned in the field trip by taking videos and making AR artifacts using the MAKPS app, and drawing concept maps or mind maps using FreeMind app on their mobile devices, and deciding what plants they wanted to study in their project-based learning as group common goals. Finally, they uploaded their group work to Google Classroom. Days 5–9 “plan and execute” task: Groups worked out plans for growing the plants they chose, such as what plant to grow, how many samples they would like to prepare and what living conditions for each sample; how to observe and document their growth, and carried out their plans of raising them. In this process, they needed to prepare the containers for the plants at home, collect data by taking records of the plants’ growth with thermo-hygrometers and light-meters, take photos daily to document the plants’ growth and make AR artifacts whenever they considered necessary, and upload the files to Google classroom daily. They also needed to analyze the data and present the results. Finally, they created their group project booklets by making use of the artifacts and the results. Day 10 “monitor and reflect”: Groups shared their group project process and outcomes in class for the teacher and peers’ comments, and updated their group project booklets where necessary. Some groups also made reflections on what they had learned by making video clips which were used to create AR artifacts with MAKPS app, and embedded them in the group project booklets. Finally, they uploaded their group project booklet to Google Classroom. A post-domain knowledge test and student focus group discussions were conducted at the end of the project. Data collection included student artifacts such as pictures or videos captured using mobile devices to document the process of plant growth, downloaded online resources, concept maps, notes related to the plans of the group project, and group created project booklets as final project products, in which group created AR artifacts were embedded. In addition, four focus group post interviews (Rabiee 2004) were conducted in order to “hear the participants’ voice”. The interview items (5 items with follow-up questions) were related to the research aims about collaborative problem competency in project-based learning. The interview items were reviewed by an experienced researcher. Thus, the interview instrument had face validity. Each of the interviews consisted of three to four members, and lasted about 35 min and was recorded. Further, students’ post-reflections were also collected. The reflections were in the forms of written text and video recordings in Chinese. All the data were submitted to the Google Classroom, some of which were selected and incorporated into the final project product - project booklet. 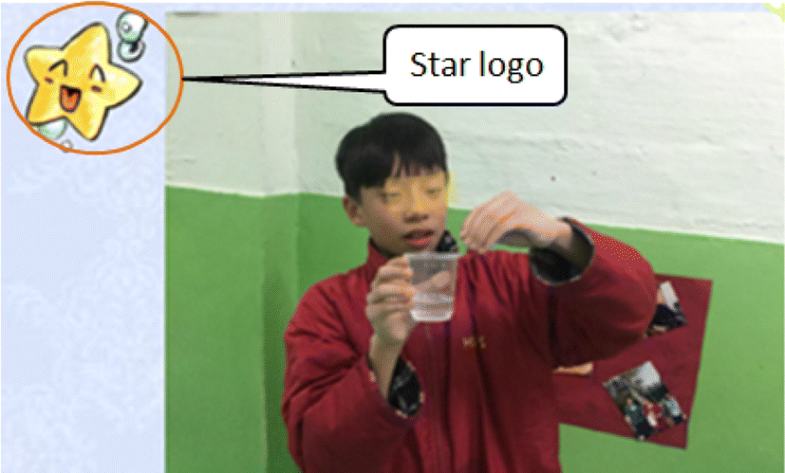 The video recordings were embedded in the booklet in the form of an AR picture with a star logo (see Fig. 4), which could be scanned and accessed. The interviews were conducted in Cantonese. All the recorded data were transcribed from Chinese into English for content analysis in English. Finally, pre- and post-domain knowledge tests consisting of eight multiple choice items (a, b and c choices) on conceptual knowledge related to plants and their environments were conducted the day immediately before and the day immediately after students’ project-based learning activities. The items were constructed based on the science learning curriculum. All the students participated in the tests. Mixed data analysis methods were utilised. First, “process-oriented analysis” was adopted in a natural context (Järvelä et al. 2008, p. 305) including on-task analysis and content analysis to understand the process and outcomes of the students’ collaborative problem solving competency in the project-based learning in the two classes (see Fig. 5). In particular, process-oriented analysis using a multiple-methodological qualitative approach via overlapping and interactive analysis of data between on-task analysis and content analysis offered a more profound understanding of the cases (Song 2016). On-task analysis in this study was conducted using the framework of the “matrix of collaborative problem solving skills” (PISA 2017) premised on the evidence-centered design (ECD) framework (Mislevy and Haertel 2006), in which “assessment is considered a process of reasoning from imperfect evidence using claims and evidence to support the inferences being made about student proficiency” (PISA 2017, p. 26). In this study, the framework of the matrix of collaborative problem solving competency focusing on the analysis of student activities in each of the project-based learning task components (vertical) is presented in Table 1: “explore and understand, represent and formulate, plan and execute, and monitor and reflect (PISA 2017) together with the collaborative components (horizontal) of “establish and maintain shared understanding, take appropriate action to solve the problem, and establish and maintain team organization”. The score on each component was given based on the detailed instructions in PISA (2017). Each task contained one or more items to be scored. Each item was coded from zero to a number of categories (0, 1, …categories). The project-based learning task components were coded as (A) Explore and understand (20 scores); (B) Represent and formulate (25 scores); (C) Plan and execute (30 scores); and (D) Monitor and reflect (25 scores). The collaborative learning components were coded as (1) Establish and maintain shared understanding (45 scores); (2) Take appropriate action to solve the problem (25 scores) and (3) Establish and maintain team organization (30 scores). The collaborative problem solving competency of each group was the result of the matrix ABCD1, ABCD2, and ABCD3. The weighting of the collaborative learning components (1) and (3) were higher because these competencies were closely related to collaborative skills; and (2) was more related to problem-solving behavior within a collaborative context (PISA 2017). An example of collaborative problem solving competency analysis in Group 1 Class 1 is presented in Table 2. Content analysis was used to analyze focus group interviews, student post-reflections and project booklets using the matrix of collaborative problem solving as the coding framework. All the data analysis results served for addressing the research question about the effect of project-based learning with PF instructional design in a seamless learning environment on collaborative problem solving competency. The inter-coder reliability regarding collaborative problem solving competency in Class 1 and Class 2 was assessed by two independent researchers. One researcher working on this project as a research assistant had 1 year prior experience in doing data collection and analysis of technology-supported science inquiry at a primary level before joining this project; another researcher whose research expertise was in collaborative problem solving and data analysis worked part-time on this project. To ensure a consistent score standard, the two researchers did a pilot data coding of two groups of students from a non-experimental class using the matrix of collaborative problem solving as the coding framework before they actually coded the data in this study. The statistical results show that the correlation coefficient (r) of the two coders for Class 1 was .81 (p < .01), and for Class 2 was .79 (p < .01), indicating that the inter-rater reliability was high in this study. Finally, descriptive quantitative analysis using SPSS version 24 was conducted to analyse pre- and post-domain tests in Class 1 and Class 2. The overall data analysis process of this study is presented in Fig. 5. Figure 5 shows firstly, that on-task analysis was adopted to analyze the data collected in the process of students’ project-based learning in the forms of pictures, online resources, notes and video clips guided by coding framework of the matrix of collaborative problem solving competency; secondly, that content analysis was employed to analyze group created artifacts—group project booklet, student post-reflections and student focus group interviews after the project-based learning to triangulate the results; thirdly, that pre-and post-domain tests were analyzed to further triangulate the results guided by the same coding framework. The three data analysis processes were not linear, but iterative and interactive to understand better the effect of project-based learning with PF instructional design on students’ collaborative problem solving competency. To address the research question: “What is the effect of the project-based learning with PF instructional design in a seamless learning environment on students’ collaborative problem solving competency?”, the results are presented in three ways: (1) overall results of collaborative problem solving competency in Class 1 and Class 2 are presented first; then (2)results of pre- and post-domain tests; and finally (3) the results of one group’s collaborative problem solving process from each of Class 1 and Class 2 were selected for comparison and contrast across the two cases in order to evaluate the groups’ collaborative problem solving through the artifact creation approach. The final results of all the groups’ collaborative problem solving competency in Class 1 and Class 2 are presented in Table 3. “Matrix” in Table 3 refers to the “matrix of collaborative problem solving competency” consisting of project-based learning task components (vertical) of “explore and understand (A), represent and formulate (B), plan and execute (C), and monitor and reflect (D)”; and collaborative components (horizontal) of “establish and maintain shared understanding (1), take appropriate action to solve the problem (2), and establish and maintain team organization (3)”. Table 3 shows that in general the scores of collaborative problem solving competency in Class 1 were higher than those in Class 2, although the scores in Group 4 of Class 2 was one score higher than that in G2 of Class 1. This indicates that generally speaking, students in Class 1 adopting project-based learning with PF instructional design outperformed those in Class 2 without PD instructional design. It is also noted that groups in Class 1 achieved higher scores in the aspects of “Establish and maintain shared understanding” (see Matrix 1 in Table 3) and “Establish and maintain team organization” (see Matrix 3 in Table 3) in their project-based learning tasks than those in Class 2. The results of pre-and post-domain tests related to the topic of “plant adaptions” in Class 1 and Class 2 were presented in three steps. First, the mean scores of pre- and post-domain knowledge tests in Class 1 were 3.25 and 4.07 respectively; and in Class 2 were 3.15 and 3.19 respectively. Secondly, a difference score for each student between post-domain test and pre-domain test was calculated for each class. The results are presented in Table 4; Table 4 shows that the mean difference of Class 1 was .82; while that of Class 2 was .00. This means that there was no change in science learning on the topic of “Plant Adaptations” in Class 2 after the project-based learning, but comparatively larger change in Class 1. Thirdly, the means of the difference scores between the two classes was compared using independent samples test. The mean difference of Class 1 was significantly larger than that of Class 2 (p < .01). Therefore, it could be concluded that students in Class 1 significantly outperformed students in Class 2 in the domain knowledge tests. This indicates that students in Class 1 had better conceptual understanding of science knowledge than those in Class 2. One group with the highest scores in collaborative problem solving competency and the largest mean difference between post-domain test and pre-domain test from Class 1 and Class 2 was chosen respectively, i.e., G3 (with mean pre- and post test scores of 3.43 and 4.71 respectively) in Class 1 (1G3 hereafter); and G4 (with mean pre- and post test scores of 3.17 and 3.50 respectively) in Class 2 (2G4 hereafter) to present their collaborative problem solving in their project-based learning process. Each group has 6 members. The reported project by 1G3 was on the growth of shallots; and the reported project by 2G4 was on the growth of mung beans. We selected some of the artifacts created by the two groups as evidence to compare and contrast their collaborative problem solving competency in some dimensions of the matrix of collaborative problem solving competency. At the collaborative “explore and understand” stage, students in 1G3 (with 6 members) and 2G4 (with 6 members) took pictures during their visit to the school farm in the field trip and made reflections after the visit. Students in 1G3 paid more attention to the shallot which was the focus of their study and collected detailed materials for their further exploration; while students in 2G4 made reflections individually on different plants or environments they were amazed at. For example, Group member 3 reported, “I saw Mimosa pudica the first time in my life. If Itouch it, it will close itself. I also like cactus which is full of niddles. I experienced the wonder of the plants…”. The group did not identify their group’s research problems after the field trip collaboratively. In addition, members in 1G3 learned how to plant shallots outdoors and indoors. In particular, they took some pictures of shallots in an outdoor garden in order to compare them with what they planted and identified the differences between them. Thus, at this stage, members reached common understanding of the plants and what topic of the project they planned to work on. They would like to explore whether it was more effective to plant shallot in water than in soil and what factors might influence the growth of the shallot. However, 2G4 members’ reflections were not as focused as the members in 1G3. All of them expressed that they knew different kinds of plants. Members 2, 3 and 5 in the group pointed out that plants could be used for various purposes. For example, they could be used for food and medicine. Members 1 and 4 stated that different kinds of plants have their own living conditions. But, none of them gave concrete examples to demonstrate their shared viewpoints and understanding. The group reported that the problem that they would like to explore was whether mung beans could grow well in Coca Cola instead of water, but they did not elaborate why and how they raised the problem. Regarding collaborative interaction among group members in solving problems, according to the artifacts created by the two groups and the results of focus group interviews, both of the groups reported that they uploaded materials to Google classroom and shared with their group members during the whole process of the project. Member 4 in 1G3 reported, “We upload our materials to Google classroom where the teacher and students from other groups can also see the information. And then we reorganize, analyze and explain some important materials to other group members.” In addition, students in 1G3 reported that they always communicated with their members via the social software called WhatsApp when they were faced with difficulties after school. This suggests that students in 1G3 shared a common goal in the project-based learning, and invested a concerted effort in problem solving, which was hardly found in students in 2G4. While, Member 1 in 2G4 stated, “We upload relevant materials to Google classroom for sharing, but sometimes we may forget to do it since there are so many materials to upload.” This indicates that 2G4 did not have good commitment to the group project. In the collaborative project-based learning, members in 1G3 used a graphic organizer—FreeMind app to share their reflections on their prior knowledge about plants, and what they wanted to explore in the project (The student real names were replaced by students 1–6) (see Fig. 6). Figure 7 shows that the group members used the graphic organizer as a tool to maintain group organization, where they could brainstorm what they knew about plants and what they wanted to learn in the project-based learning. However, no members in 2G4 did this. Instead, they reflected individually in written text. This indicates that students in 1G3 had better collaborative learning competency than those in 2G4. In terms of building a shared representation and negotiating the meaning of the problem to reach a common ground, group members in 1G3 drew a concept map using FreeMind app (see Fig. 7), showing the (herbal) plants’ medicinal purposes, living environments, growth conditions, and examples of herbal plants and their relations. 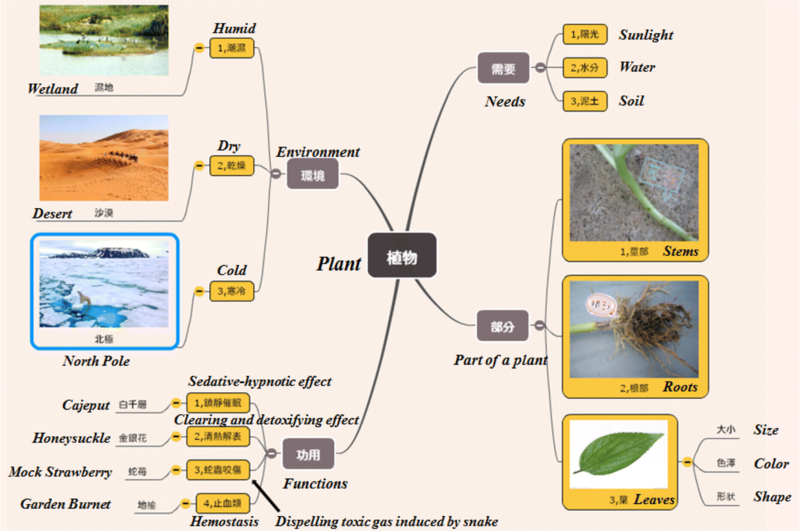 Instead group members in 2G4, who had been interested in a lemon tree in the field trip, drew a mind map using the graphic organizer—FreeMind app to brainstorm what they knew about lemon, and its living environments, growth conditions, shape, and growth conditions (see Fig. 8). Although both concept maps and mind maps are powerful graphic organizers, concept mapping tends to leverage logical thinking and outline relationships between key concepts in a topic (Davies 2011; Van Zele 2004), while mind mapping tends to improve generation and association of ideas for brainstorming (Davies 2011; Eppler 2006). Comparing concept mapping to mind mapping, the former is less general and shows more complex association of ideas between links than the latter (Davies 2011). 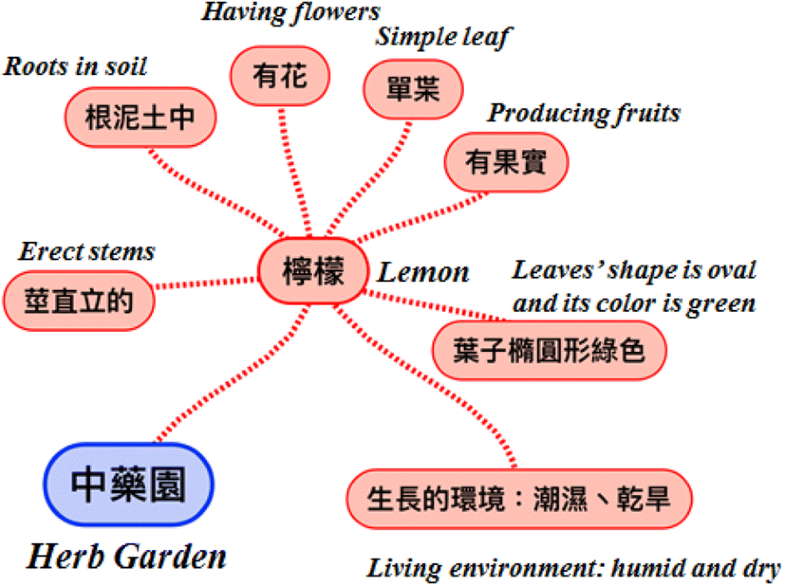 This indicates that students in 1G3 were more engaged in finding out the relationships between the concepts related to the process of the plant’s growth; while students in 2G4 focused on brainstorming the feature of a certain plant (lemon) and its living environment, which was not closely related to the research goals in their project-based learning. In addition, members in 1G3 made reflections in the form of self-created video clips to report what they knew about plants and what they would learn from their project. They reported that they learned that different varieties of plants needed different living conditions, and the growth rate of plants was related to temperature, humidity and luminosity/brightness in their environments. They wanted to learn how to plant the shallots in water and soil, and how to make them grow better. While members in 2G4 made audio recordings to show what they knew and what they wanted to know through their project. For example, they reported that they knew water, sunlight, air, and soil were essential for the growth of plants, and they would like to know why they were necessary for plants. In planning and executing the project, members in 1G3 indicated in the post-interview that they decided how to conduct their experiment after group discussion. Furthermore, they communicated well about how to record their data during the whole inquiry process. They developed a standard record form and took down temperature, humidity and luminosity in three different living conditions and made records of the growth height of shallots. Moreover, they captured pictures to document the plant’s growth as data for result analysis and project report writing. Members in 2G4 reported in the interview that they discussed how to conduct the experiment on raising mung beans. However, they did not communicate very well with each other on how to record their experimental data in the process of planting. As shown in their files, some members only took a few photos to record the growth of mung beans, and others just added some simple descriptions under the photos. Moreover, the majority of descriptions were vague, such as that mung beans grew better in the water than in the Coca Cola or that some mung beans had sprouted. In growing the plants, members in 1G3 planted shallots in three different living conditions and explored how the environmental factors like sunlight and water influenced the plants’ growth. When facing problems in the project, they would like to look for materials and discuss with their group members to propose solutions collaboratively. In addition, they collected detailed data in order to develop a comprehensive understanding of their experiments (see Fig. 9). They took down the data about temperature, humidity and luminosity in three environments, and the growth height of shallots daily. They also summarized the status of the plant growth daily. Moreover, they took notes on the pictures to illustrate the growth process of shallots clearly. Members in 2G4 planted the mung beans in two conditions: one in water and the other in Coca Cola. When they were confronted with difficulties during the experiment, they would like to look for information from the Internet, and then discuss with members how to solve them, or turn to the teacher for help. However, their data collection was quite simple. They mainly used text to describe the growth process of their plants vaguely. Occasionally, they used a picture to show the growing situation of the plant (see Fig. 10). 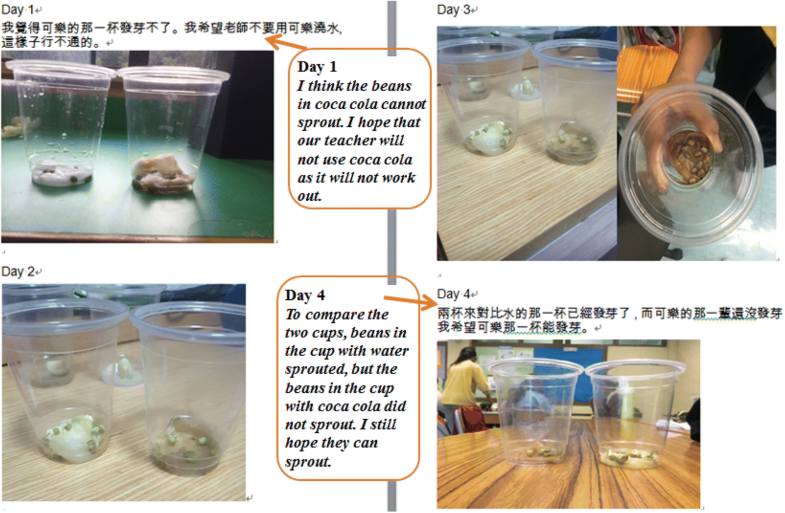 For example, in Day 4 of growing mung beans, Member 5 noted, “To compare the two cups, beans in the cup with water sprouted, but the beans in the cup with coca cola did not sprout. I still hope they can sprout.” It is noted in the remark that Member 5 observed the growth of the plant and found the problems that occurred to the mung beans in Coca Cola. However, instead of exploring information about how Coca-Cola would affect the growth of the plants, he did not take further actions. Thus, the group could not complete their project plan satisfactorily because the members did not have the awareness of their “knowledge gaps” that sugar in a flavored drink like Coca Cola could prevent the plants from absorbing the nutrients from the carbonated beverage and might actually kill the plants when they stared doing the project although they learned it after they completed it. Just as Loibl and Rummel (2014) posit that only when learners become aware of their knowledge gaps when working on new problems can they learn from failures or mistakes. In establishing and maintaining team organizations to carry out the project plans, members in 1G3 had clear division of labor and collaboratively completed their tasks. The daily recordings of the plant growth show that each group member participated in data recording activities, and they took turns to collect detailed experimental data. They used data logger to measure the temperature, humidity, luminosity and the height of shallots in three different living conditions every day. In addition, they made analysis based on these data and took down them in the data forms (see Fig. 11). Some members indicated in the interview that they understood the importance of team collaboration during their experiment, and would like to contribute to the group project with a down-to-earth spirit. Members in 2G4 did not show great enthusiasm for their collaborative work evidenced by the observation and interview results. They uploaded their data files to Google classroom for group and class sharing and comments. However, collected data show that only two members commented on the data and responded to questions from other groups. Moreover, students who were responsible for collecting data were not committed to their project either. Although some collected picture artifacts show that they used data logger to collect data accurately, they did not record them to document the growth of the mung beans. There is only air, no water and sufficient sunlight. And the experiment results (see Fig. 12) show that only the shallot in the first living condition (a) began to sprout and grow (indicated with an red arrow), while shallots in other living conditions became dried (c) or the outer layer of the shallot started to fall over gradually (b). The group members made three conclusions based on their experimental results, and by studying other groups’ experimental results. Firstly, they believed that some kinds of plants could grow well in different living conditions but others could not. They observed the growth situation of the lettuce in 1G4, and found that it could grow well in the soil and in the water, while their shallot could not grow in water. Secondly, plants could not grow well without photosynthesis. They observed that seedlings of their shallot in the first living condition were green. Also the lettuce in the environment with the air, water and sufficient sunlight in 1G4 was green. By contrast, the lettuce in the environment without sufficient sunlight was light green. Thirdly, water, the air and sufficient sunlight were essential for plant growth. They compared shallots in two other living conditions, as well as the lettuces and radish leaves compared in the same conditions by other groups, and found that none of them could grow healthily. They synthesized their findings as well as the findings from other groups, and drew a comprehensive conclusion to solve their problems successfully after the teacher’s facilitation at the end of the project. Members in 2G4 mainly explored whether mung beans could grow in Coca Cola and water. After finishing their experiments, they knew that mung beans could not grow in Coca Cola (see Fig. 13a), but in water with cotton to prevent the beans from decaying (see Fig. 13b). They also searched information about it. Based on the materials, they concluded that the carbon dioxide in Coca Cola would isolate mung beans from the air, and phosphoric acid in Coca Cola would corrode their seed coat and embryo. Thus it was not feasible to grow mung beans in Coca Cola. Students in 1G3 made analysis daily based on their observations and collected data (artifacts) in their experiments (see Fig. 14). Figure 15 shows that on the 5th day, the group members observed the differences between the shallots which grew in three conditions: shallot in condition (a) with air, water and sufficient sunlight grew taller and was transplanted into the soil; shallot in condition (b) with air and water without sufficient sunlight did not grow; and shallot in condition (c) with air, but no water and sufficient sunlight became dry in the outer layer. Similarly, on the 6th day, the group members observed and documented the changes of the shallots’ growth in the three conditions, and made speculations on the reasons why the shallot growing in condition (a) could grow taller. Moreover, they observed and compared their experiments as well as other groups’ carefully, which contributed to their problem solving process. However, students in 2G4 did not analyze their daily collected data, which was not helpful for them to obtain an in-depth understanding of the situations of the plant growth. In the group reflections, members in 1G3 made more detailed reflections after the project-based learning. They expressed their views and shared them with other groups. They also made video clips and created the AR artifacts using the AR app adopted in this project to reflect what new knowledge they learned in project-based learning. Students in 1G3 reported that they learned that shallots could be planted in water. But shallots needed to be transplanted to the soil because they needed to get nourishment from the soil. They also knew that different kinds of plants needed to live in different environments. For example, mung beans could grow faster in an environment lacking abundant sunlight and shallots could not grow well in water but lettuce could. Besides, they understood in more depth about the importance of photosynthesis for healthy growth of plants. Most importantly, through this collaborative project-based learning activity, they realized teamwork was vital for the success of their project. Moreover, even though they failed to grow the shallot in water, they obtained ample evidence to solve their problems consolidated by the teacher, and did not feel frustrated or disappointed about the failures. They mentioned that the sharing of the group project work in the class and the teachers’ facilitation and instruction was useful for them to solve their misconceptions and get deeper understanding of the concepts related to plants and their environments. Thus, they also reported that they did learn from failures. On the other hand, members in 2G4 made shallow reflections via video clips about what they learned and what the most unforgettable things were in their project. They knew from their inquiry activity that mung beans could not grow in cola. 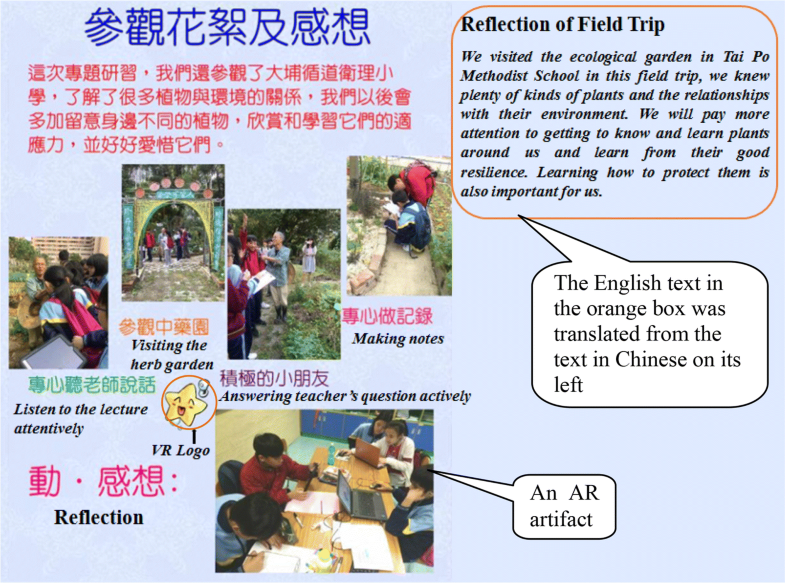 Furthermore, the most unforgettable experience for the majority of learners was to visit the school farm in the field trip rather than doing the collaborative project. Through this field trip to the ecological garden, we found that shallots planted outdoors were healthier and could grow faster than those planted indoors. Even though the planting duration of outdoor shallots was the same as that of our indoor ones, the color of outdoor shallots was darker. Similarly, we could find out that indoor lettuce planted by Group 4 grew slower and its color was lighter. From the above reflections, we know that they found the factors that influenced the plants’ growth not only from their own group’s project work, but also consolidated their findings by observing another group’s project of growing lettuce indoors. This suggests that the group advanced their conceptual knowledge about plants and their environments in the project-based learning experience. Throughout the 1G3 report, the AR artifacts (video clips) created by the students were embedded in it (see Fig. 15 for an example). By doing so, the project booklet was augmented and enriched by video clips. The members in the group were motivated to produce the best work they could and deepened their knowledge. In Fig. 15, the star circled in orange at the left bottom indicated that the picture next to it was an AR artifact. The members in the group reported that the artifacts, especially the project booklet they created made them feel strong ownership of their own learning and would like to do more such studies in future. We visited the ecological garden in Tai Po Methodist School in this field trip, we knew plenty of kinds of plants and the relationships with their environment. We will pay more attention to getting to know and learn plants around us and learn from their good resilience. Learning how to protect them is also important for us. This reflection was not associated with their own research project and there was no mention of comparisons between their observations on the school farm and the plan of the plants they grew indoors. Is less guidance in PF instructional design more effective in enhancing students’ collaborative problem solving in science? In this empirical study, project-based learning with PF instructional design was adopted in one primary students’ science class to enhance their collaborative problem solving competency. With the PF instructional design, students in Class 1 were engaged in problem solving without explicit guidance, followed by the group sharing in class and teachers’ explicit facilitation of the misconceptions and instruction of the new concept for knowledge assembly (Kapur 2014, 2015). By contrast, students in Class 2 received project based instruction without PF instructional design. The results of this study show that students in Class 1 with PF instructional design significantly outperformed those in Class 2 in conceptual understanding of the science knowledge related to plants and their environments and their inquiry process and final product – the project booklet, which echoes the findings in studies with similar designs (Kapur and Bielaczyc 2012; Loibl and Rummel 2014). However, this does not mean that PF design with little or no explicit guidance in problem solving followed by instruction guarantees productive and successful solutions. Loibl et al. (2017) maintain that the benefits of problem solving without prior facilitation would be gained only if the problem is presented in the form of contrasting cases or if students’ problem solutions are shared and discussed in later instructions. In that study, students suggested raising two types of plants, of which each was put in three different living environments for comparison and contrast. In the meantime, they could also access and observe other group’s work. During their exploration and comparison process, their prior knowledge could be activated, which was the prerequisite for developing their awareness of the knowledge gaps, and initiating modification of their erroneous solutions (Loibl et al. 2017). This could partially explain the reason why students in Class 1 in our study could succeed in their problem solving. In addition, by comparing the cases within their groups and with other groups, 1G3 in Class 1 also worked out the solution that plants raised indoors and outdoors grew differently, which could be considered “deep features” of the science concept identified by the group through contrasting cases (Loibl and Rummel 2014; Schwartz and Martin 2004). In contrast, students in Class 2 did not workout good solutions to their problem. This might be due to the facilitation that the teacher provided to help the students “keep on the right track” and avoid time-consuming struggles such as deciding for them what plants they could grow and how to grow them, thereby hindering the students’ problem-solving motivation (Santagata 2005). Although the problem was solved, the intellectual challenge was lost (Granberg 2016). However, Holmes et al. (2014), based on their research results, maintain that not all failures are equally productive, and in some cases, some forms of scaffolding may help students learn from their failed attempts. Although the results of this study show that with less instruction in the inquiry process, students achieved better problem solving skills and conceptual understanding in the project-based learning with PF instructional design, the scale of the empirical study was small and the length of this study was short. Thus more research is needed to explore the effect of project-based science learning with PF design on collaborative problem solving competency in primary education. To sum up, PF instruction design with less or no guidance prior to problem solving in science learning does not guarantee successful problem solutions. What matters is the pedagogical design of the learning activities. Does PF instructional design promote collaboration in problem solving? An interesting finding of this study is that students in Class 1 who received project-based learning with PF instructional design outperformed those in Class 2 in terms of “establishing and maintaining shared understanding” and “establishing and maintaining team organization”. In the detailed analysis of 1G3 in Class 1 and 2G4 in Class 2, it is noted that members in 1G3 were more self-regulated to set common goals and have a division of labor in achieving their goals. The students in Class 1 with PF design acted as novices and attempted to observe and explore the plants on the school farm, and activate their prior knowledge (some might be quite intuitive), and become aware of the problem/knowledge gap that they would like to research, then apply a yet-to-be-learned concept to solve their problem collaboratively although they might encounter failures (Kapur 2014). However, the students were provided chances to face the challenges and try different possibilities by comparing and contrasting different conditions and cases in order to succeed in the solutions. At times, they were engaged in unproductive struggles, and wanted suggestions to try alternative ways to solve the problem (Granberg 2016). In this process, the students needed to be flexible and willing to make necessary compromise to accomplish their common goals (PISA 2017), hence, encourage them to explore and achieve shared understandings and team organization. By contrast, the students in Class 2 without PF design were aware of what problem they were expected to explore and how to solve the problem prior to the collaborative work. This might have prevented them from maintaining shared understanding and team organization, which in turn, might influence the quality of their solutions to the problem such that the solution might be “shallow” without identifying deep features. What role do mobile technologies play? In this study, mobile technologies supported students’ project-based learning across all stages and settings, especially for students in Class1 with PF instructional design. For example, students in 1G3 in Class 1 used the mobile devices to collect data on the school farm and in their experiment of raising the plants. They compared and analyzed the collected data, then formulated their own conceptual understanding of the environmental factors that influenced the growth of the plants. Without mobile devices, such comparisons could hardly achieve. Although many existent studies have reported similar findings (e.g., Khaddage et al. 2016; Lai and Hwang 2015; Song 2014), the mobile technologies used in the PF instructional design provided students not only the affordances for collecting, comparing and analyzing data, communicating with group members, searching useful online information, sharing files online and making reflections in video format, but also the affordances for creating their own AR artifacts with video clips, which motivated them to learn. The content specific artifacts they created using mobile devices enabled them to reflect, self-check, externalize and refine their prior knowledge, develop deeper understanding of new knowledge and represent their understanding of their project problem and make their thinking visible (Ke and Hsu 2015; Song 2014). Because the AR artifacts and the booklet belonged to them, hence they developed a sense of ownership for their own learning (Kearney et al. 2012). The article reported an empirical study designed to explore the effect of project-based learning with PF (PF) instructional design in a seamless learning environment on students’ collaborative problem solving competency.Two classes were involved in this study: Class 1 adopting project-based learning with PF instructional design; and Class 2 adopting project-based learning without adopting PF instructional design. Student’s collaborative problem solving competency was first evaluated using the matrix of collaborative problem solving competency (PISA 2017) to quantify the qualitative data. It was found that students in Class 1 outperformed those in Class 2 in general in terms of collaborative problem solving competency in science learning. Secondly, pre- and post-domain tests were conducted. The results suggest that students in Class 1 had better conceptual understanding of the science knowledge than those in Class 2. Finally, students’ collaborative problem solving was further examined by comparing and contrasting the collaborative problem solving process in the projected-based learning experience in one selected group from each class (1G3 and 2G4). 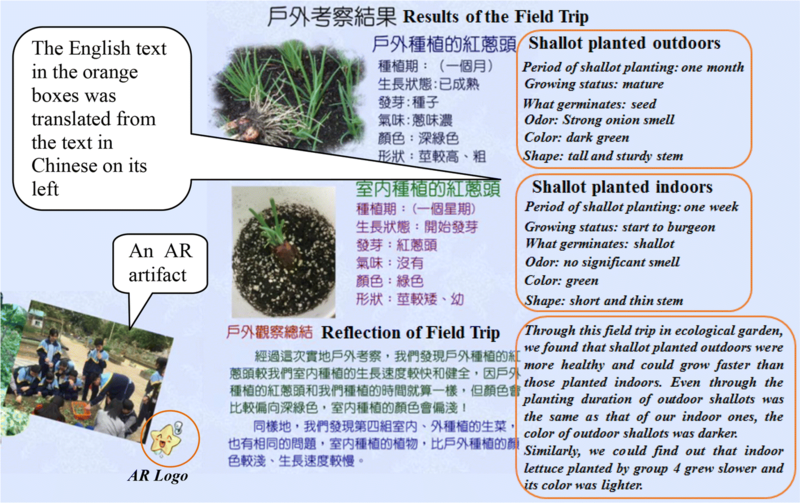 The results show that the members in 1G3 using PF instructional design gained deeper understanding and reflective learning of the factors influencing the growth of the shallots they raised in three conditions, and formed strong groups actively engaged in the project to reach the common goal of learning. Students in 1G3 developed ownership of learning through the project-based learning process and outcomes, especially the production of the project booklet. They would like to be involved in more such learning activities. By contrast, the students in 2G4 without PF instructional design had shallow understanding of the project on the topic of relationships between living things and their environments. They reported more on their field trip experience on the school farm than the actual project they were involved in. The findings indicate that (1) the students in Class 1 gained deeper understanding of conceptual knowledge and produced better group artifacts in collaborative problem-solving quality than those in Class 2; and (2) the students in Class 1 were more positive in facing the challenges in their project-based learning process, and developed a sense of ownership of their learning. The findings imply that PF instructional design is conducive to developing primary students’ collaborative solving competency in science learning in a seamless learning environment. This study contributes to the literature in three ways. To begin with, this study adopted project-based learning with PF instructional design in primary science learning which is an under-researched area. Secondly, this study explored employing PF instructional design to develop students’ collaborative problem solving competency which has not been explored in primary science education. Finally, this is the first study to adopt project-based learning with PF instructional design in a seamless learning environment where the use of mobile technologies supported students’ collaborative problem solving process across different settings, especially in terms of group created artifacts to visualize their thinking and gain deeper understanding of conceptual knowledge. Nevertheless, this study is not without limitations. We acknowledge that Class 1 and Class 2 were not totally equivalent which might influence the results. In addition, the two teachers in the two classes might bear some external validity threat although they were both experienced teachers in project-based learning and received the same training in the professional development. Moreover, the Hawthorne Effect (McCarney et al. 2007) might not have been eliminated in this study. Last but not least, the number of participants was relatively small. In view of these limitations, the results of this study might not be able to be generalized. This study provides a basis for future research in several areas. Firstly, project-based learning with PF instructional design in a seamless learning environment should be further explored in future on a larger scale in order to develop students’ collaborative problem solving competency which is constantly emphasized in PISA research and STEM education. Secondly, how to integrate mobile technologies into project-based learning with PF instruction design effectively is worthy of study in order to offer opportunities for students to learn in real learning contexts without time and space constraints and have better control of their own learning. Thirdly, how to capture and analyze students’ collaborative problem solving process through computer-based assessment is a trend to be explored in the digital age. This study was funded by The Education University of Hong Kong under Dean’s Research Fund BFRS-1/4th round (2016-18).